There was this moment where it all came together. You might have had a moment like this before and if you did, you might remember it for a little while after it happened before having it leave your memory due to having to cram a bunch of other things in it to push this moment out. Last night, as I was driving home from the airport on Route 16, I was listening to Supertramp’s 1979 album, Breakfast in America. The last song on the album, “Child of Vision,” was playing and the chorus kicked in and I felt it, this wonderful emotional vibe since the melody and chord progressions hit me in a way that opened space for me to leave time and space for a brief moment and bask in the glory of this golden sound, but….. as I was leaving time and space, I looked up into the sky and saw the sun. And BAM…. I had an emotional experience where it felt like everything was one, the world made sense, things were right. The beauty of the sound and the beauty of the sight of the sun meshed together and I was in it- in between sound waves and light waves and I was away from the noise…the fear…the walls…the darkness…. I was alive. 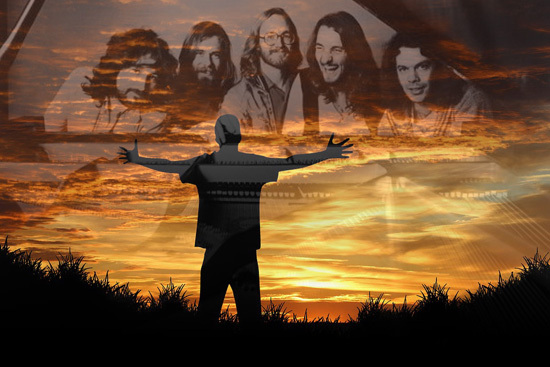 My experience with listening to Supertramp and seeing the sun and having some kind of emotional experience that was different from others sort of liberated me from the everyday, hectic, cave-dwelling darkness of dealing with mundane things, doing busywork, meeting deadlines, and basically being a slave to linear time and spatial ontologies that have been naturalized in the world. I was able to shift my focus from the everyday by letting go of it and opening myself to another world of sound and sight that seemed meaningful for a moment. I think this is symbolic of having to leave the cave by seeing that there are various conceptions of time and space and that we usually just rely on the one that has been given to us through our socialization. Interestingly, I saw the sun at 8:15 at night and it was couched in dark blue and black clouds since it had recently rained and thus the sun was a brilliant yellow-orange contrasted against the dark skies. Again, I see this as symbolic because, as Heidegger says, for us to see the sun of ideas, we have to remove ourselves from the everyday busyness of the dark clouds. Perhaps the sun of ideas is even more brilliant when we can perceive that the dark clouds that surround it make the light more intense since it is reflecting off the clouds. Furthermore, the words to the chorus of “Child of Vision” are, “Child of vision, won’t you listen? Find yourself a new ambition.” The narrator is telling her/his acquaintance that living a life of debauchery and meaninglessness through ruining one’s body and mind through drugs as well as blindly accepting what one is told is not conducive to growth and that this acquaintance should change to find a new way of being. Another line in the song is, “You watch the television, it tells you that you should." This reminds me of living in our TV rooms and never having to leave this dark cave because everything we need is on the 52” LCD screen and listening to ideas without critically reflecting on them to understand that they are only one version of truth. Again, it is easy to get stuck in the cave because it is easier to live there and not try to understand new ideas. Rather, the artist possesses essential insight for the possible, for bringing out the inner possibilities of beings, thus for making man see what it really is with which he so blindly busies himself. What is essential in the discovery of reality happened and happens not through science, but through primordial philosophy, as well as through great poetry and its projections (Homer, Virgil, Dante, Shakespeare, Goethe). Poetry makes beings more beingful. Poetry, not just any old writing! But in order to understand what the work of art and poetry as such are, the philosopher must first cease to think of the problem of art in aesthetic terms (2002, p. 47). I am not sure if Heidegger would think that Supertramp’s songs are great poetry, but this does not matter. Listening to “Child of Vision,” hearing the words in the chorus, and seeing the sun helped me shift perspective from the everyday busyness to hit some kind of primordial understanding to make myself more “beingful.” Furthermore, I was not focusing on “art in aesthetic terms” as Heidegger says. I was in it, feeling it, beyond language and terminology for a brief moment, and one with the sun. Literature, poetry, songs, lyrics, words written by these poets and writers are there and exploding and emitting rays of light through the dark clouds to help us find our way in our blindness. For us to understand the world and for us to understand each other, we do have to leave the cave, but I think it becomes more meaningful when people collaborate and work together and learn from each other. Right after I had the Child of Vision/Sun experience, I told the people sitting in the car about it. They listened and then one person told me of a similar experience she had and a dialogue ensued and old and new ideas were discussed. And, to me, this is the first step in seeing the sun of ideas and having the courage to do this, which is opening up a discussion on an idea, which starts the ball rolling to help progress through the various “stages of adaptation to the light.” Reading literature, poetry, philosophy and listening to songs gives us a chance at being transformed into something more meaningful than what we are when we sit in our caves and let the TV do the talking for us. Heidegger, M. (2002). The Essence of Truth. New York: Continuum.